Sponsor Sponsored Rides & Events Check here for rides and events our sponsors are putting on. Maurice at Bison is starting a new event at the dealership and they are offering it to the TCVR group prior to the “word-getting-on-the-street”. 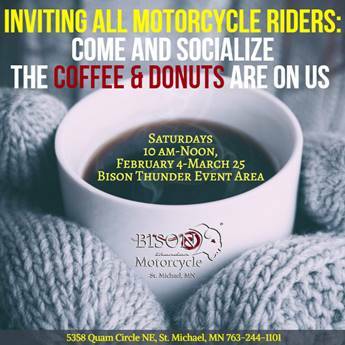 As it says, coffee and donuts, 10AM till noon each Saturday beginning February 4th - March 25 in their event area.